Fiber Optic Testers | VIAVI Solutions Inc. Experience fiber testers that achieve industry standards and promote ease-of-use. The VIAVI essential fiber testers lead the industry in helping technicians ensure best practices for handling fiber in every situation, from certifying new fiber installations to troubleshooting active fiber networks. Through technology innovation and extensive experience, our fiber testers equip technicians and network managers to ensure the performance of their fiber optic networks with fast and intuitive fiber testers that are essential for every technician. Learn more about fiber inspection and fiber testing. Our industry-leading fiber optic inspection scopes provide handheld solutions with all the necessary capabilities that fiber technicians need for today’s fiber testing and inspection requirements; including live image viewing, auto-center, auto-focus, PASS/FAIL analysis, and storing/recalling/sharing results. Innovative optical power meters that eliminate common hassles when measuring optical power, giving technicians a fast, compact and safe solution for optical power measurement. Our free mobile app makes it even easier to perform essential fiber testing by allowing technicians to inspect fiber end-face quality, measure optical power, and certify fiber connectors to industry standards right on their mobile device. Efficient and economical visual fault locator for fiber tracing, fiber routing, and fiber continuity checking in an optical network during and after installation. Contaminated connectors are the #1 cause for troubleshooting in fiber optic networks. While standards bodies have established acceptance criteria for the quality and cleanliness of fiber connector end faces, technicians still face challenges with implementing these practices. Without the right fiber testers, maintaining these standards or specifications is difficult and time consuming. 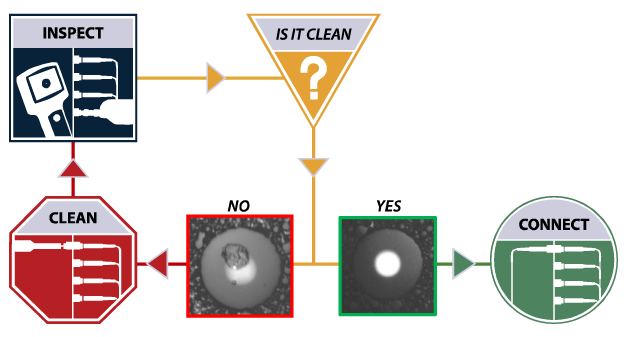 A single particle mated into the core of a fiber can cause significant back reflection, insertion loss and even equipment damage. Learn more about Fiber Inspection and our “INSPECT BEFORE YOU CONNECT” process to ensure fiber end faces are clean prior to mating connectors by downloading our fiber certification white paper. Also learn more about testing MPO connectors. Explore our industry-leading fiber optic testers and fiber tester resources at the bottom of the page. Fiber optic networks offer unprecedented speed and bandwidth to meet the ever-increasing demand for faster communication networks. The majority of worldwide data transfers now depend on fiber optics continually for reliable high-speed data transmission. Although one positive attribute of fiber optic cable is low power loss over long distances, the termination and access points to fiber optic networks are still prone to unforeseen loss events that can disrupt this vital service. Thus, fiber optic testers utilizing a variety of fiber testing methods are essential tools. U.S. and International standards have been established to regulate these fiber testing practices, and an array of versatile fiber optic testers have been developed. Testing Fiber Optics with a Flashlight? One basic type of fiber optics tester is known as a fiber optic tracer or visual fiber tracer. Similar to a common flashlight in appearance, a fiber optic tracer uses only a low-wattage LED light source or light bulb. The visual fiber tracer can verify continuity of a fiber optic path, including any connections, and ensure fibers are unbroken. These devices are used by simply attaching one end of a fiber and observing the visual light transmitted to the opposite end. This fiber light tester can also be used to test new fiber on a reel before it is deployed or to verify correct fiber connections at patch panels. Another useful fiber tester is called a Live Fiber Identifier (LFI). Using this type of fiber optics tester, the optical signal can be verified at any point along the length of the cable, without connecting directly to a fiber termination point. Using an adjustable head that is compatible with multiple fiber diameters, the LFI detects the optical signal from the outside for minimally invasive fiber optics testing. An LFI can also be converted into an Optical Power Meter (OPM) to measure both the absolute (dBm) and relative (dB) power for a given fiber optic cable. One of the simplest yet most versatile fiber optic cable testers available today is the Visual Fault Locator (VFL). This type of fiber optic laser tester works by injecting visible red laser light from a source device into one end of the fiber optic cable. The high power of a VFL will detect “leaks” by allowing technicians to visually see any defects. To use a VFL properly, the first step is to properly clean the mating surface or “endface” and inspect it with a microscope to ensure cleanliness. The VFL is then connected directly to the connector ferrule using a universal connector interface. Due to the high power of the laser light, you should never view the output of a VFL with the naked eye. Once connected and powered on, the VFL will fill the core of the fiber with laser light so that the cable can then be inspected for defects. Breaks may be visible through the jacket of the fiber optic cable, although black or gray colored jackets tend to obstruct the visibility of the light. A VFL is also an effective fiber tester for continuity, fiber tracing, and fiber identification. An Optical Time Domain Reflectometer (OTDR) is the only fiber optic light source tester available that can accurately identify the magnitude and location of fiber loss points caused by breaks, bends, or defective connections. Unlike other tools that measure loss properties directly, an OTDR fiber tester operates indirectly by analyzing the light which is backscattered to the source. The principle of Rayleigh scattering allows a small percentage of light photons to be reflected back to the source, due to collisions with microscopic particles within the fiber. This backscattered light can then be analyzed to determine the position and power loss of attenuation events along the optical fiber link. An OTDR is a powerful tool that requires training and practice in the hands of skilled technicians. While most OTDR equipment includes an “auto-test” mode, understanding the available OTDR test parameters will enable correct configuration of the OTDR, depending on the complexity and length of the optical fiber run. For example, setting longer pulse width and distance range settings on the OTDR fiber tester might be appropriate if the fiber link to be tested is 100 km or more. Most OTDR displays will include a combination of numeric and graphical results. The graphical display will generally include a plot of distance vs. power (dB) to provide information on the slope of the attenuation coefficient and the position and type of additional attenuation sources. A trained OTDR operator will recognize the “signature” of such common attenuation events as splices and bend points. Each connection and termination in an optical fiber network, as well as the attenuation of the optical cable itself, contributes to the total system loss. The insertion loss is defined as the amount of light that is lost between two fixed points in the fiber. The value of this parameter is expressed in decibels (dB) and is sometimes referred to as simply the “loss” or the “attenuation” of the fiber optic cable. During the design of a fiber optic network, the strength of signal required at the receiving end will be determined, and the transmitter, fiber, and all components along the length of the cable will be chosen carefully in order to consistently meet these performance needs. Fiber optic testers are then used to determine if the loss budget calculated during the design phase has been exceeded. Specifications for cables and connectors are very accurate in term of loss properties, although factory testing is typically performed with high-end reference connectors that create more optimal performance conditions. Adding up the theoretical loss of each component is the practical first step to determine if the loss budget has been exceeded. With the ever-increasing bandwidth demands on today’s fiber optic networks, staying with the loss budget has gained importance. The only way to know for sure if this has been achieved is through effective fiber monitoring and testing methods, including test loss sets, for Tier 1 certification. Fiber optic testers may vary in complexity and functionality, but acting as a comprehensive fiber testing kit, they can be used to prevent, detect, and repair loss and damage to essential fiber optic networks. Обращайтесь к нам для получения дополнительной информации, ценовых предложений, просмотра демонстрационных видеороликов по нашей продукции. Мы всегда готовы оказать вам всю необходимую помощь.